The area of today's city district "Prenzlauer Berg" used to be known as the "Feldmark". 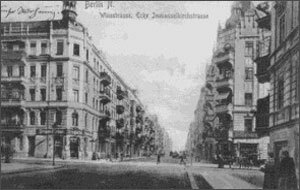 In 1920 it officially became part of the city of Berlin, then called administrative district 4 "Prenzlauer Tor". The new borough added about 310,000 inhabitants to Berlin's population. 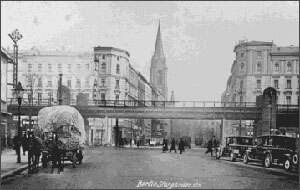 In 1921 the name of the district was changed to "Prenzlauer Berg". It has an area of approximately 10.9 square kilometres and a population of about 147,710 inhabitants (as of 31 Aug 1994). 192 streets and squares are part of the district or borough. The structure of the road network in Prenzlauer Berg is a result of the planning work by James Hobrecht (1825-1902), the government's master builder. He planned a network of streets that formed a rectangular grid across the north and north east of the city. His construction plans were published in 1862. The intended streets and squares were labelled with numbers and letters and the area of today's borough was divided in subareas XI, XII and XIII. All streets and squares were named properly in the process of construction. Soon new residential areas and companies were built to provide supplies for the city. Thus the French quarter was developed after the German-French War in 1870/1871. It is situated between Schönhauser Allee and Prenzlauer Allee and can be recognised by its streets which have been named after places in France such as Strasbourg, Metz, Mülhausen and Kolmar. 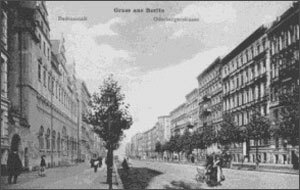 Some streets were named to honour Prussian generals such as Fransecky and Tresckow, however, these streets are now Sredzkistraße and Knaakstraße. 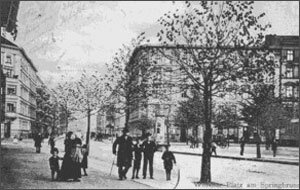 Today's Danziger Straße was named in 1874 but had already been in existence as an important transport road since 1822. North of the Danziger Straße streets were preferably named after famous or historic personalities. Among the people who were honoured by having a street named after them were the archaeologist Heinrich Schliemann, the physiologist Hermann Helmholtz, the jurist Heinrich von Gneist, the inventor of lithography Aloys Senefelder as well as the long-serving mayor Hermann Duncker. 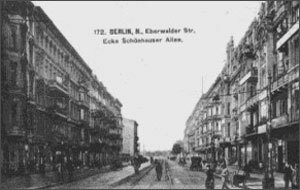 Some of the streets, which had been constructed after the turn of the century near Bornholmer Straße, later formed the so-called Nordic Quarters. Here Finnländische Straße, Gotlandstraße and Malmöer Straße can be found but also streets which honour the Danish author and poet Anderson, the author Björnson and the playwright Ibsen, both Norwegian. Near Greifswalder Street and south of the city train railway the Prussian Quarters started to grow around 1911. The streets there have been named after places in former East Prussia. However, names such as Bartenstein, Goldap, Gumbinnen or Rastenburg were replaced in 1974. These streets are now without exception named after opponents of National Socialism, who lost their lives between 1933 and 1945. The same applies to the Western Prussian Quarter, which is situated between the Friedrichshain and the city train railway. Here streets were renamed in 1904/06. In 1974 about 18 streets were renamed. After the first World War the streets north east of the city train station Landsberger Allee mainly received names from flora and fauna, such as lilies and snowdrops. 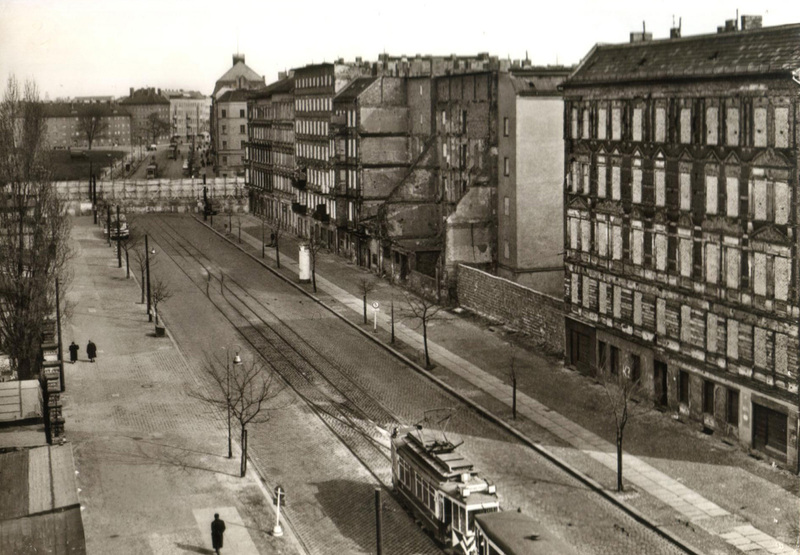 In 1931 many newly built streets between Ostseestraße and city train line received names of union leaders such as Robert Dißmann, Martin Segitz, Adam Drunsel. However, these names disappeared again in 1933 when the streets were named after battlefields of the first World War, such as Langemarck and Flandern. 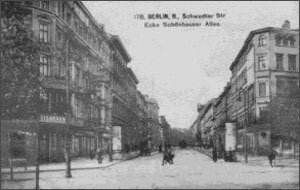 All together these streets received three different names within two decades because in 1948 their names were changed again to honour opponents of the National Socialism such as Otto Schieritz, Arthur Sodtke and Erich Küsel. In comparison to other quarters of the city only very few streets in Prenzlauer Berg have received new names or were newly built after 1945. 16 streets and squares were renamed between 1933 and 1945. After that until 1990 47 streets and squares received a new name. In 1992 the Leninallee officially went back to its original name, Landsberger Allee. In 1993, three streets received new names: Fritz-Dahlem-Straße is now Ella-Kay-Straße, Wilhelm-Florian-Straße became Lilli-Hennoch-Straße and Werneucher Straße now is Margarete-Sommer-Straße. Two streets were given back their old historical names: Behmstraße and Schivelbeiner Straße. Part of a street that had not been named before is now Diesterwegstraße. After having been without a name for twenty years, the Arnswalder Platz officially returned to this, its historical name. Finally, Wilhelm-Pieck-Straße was renamed in Torstraße in 1994. The final decision on the new code of arms after the fusion of all three city boroughs has as yet to be made. Approximately 6,500 children under the age of six and about 6,500 children up to the age of 15 are currently living in the area. 35,000 people are between 15 and 30 years old while 65,500 people are between 30 and 60 years of age. 60 and older are 21,000 people. There are 16 primary schools in the area, along with seven high schools of various types and two special schools. These schools are attended by about 11,000 students. In addition there are four Gymnasien, the most academic type of German high schools. Since the gas works and the breweries closed down in the last century, there has not been much industry in the area. Small-scale enterprises, retail, culture and mainly hospitality (gastronomy) form the economic profile of the area.